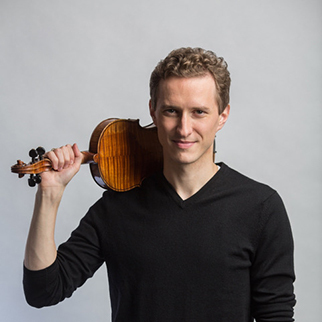 Josef Špaček, violin, is fast emerging as one of the most accomplished violinists of his generation. He studied with Itzhak Perlman at The Juilliard School in New York, Ida Kavafian and Jaime Laredo at the Curtis Institute of Music in Philadelphia, and with Jaroslav Foltýn at the Prague Conservatory. He was laureate of the International Queen Elisabeth Competition in Brussels and won top prizes at the Michael Hill International Violin Competition in New Zealand, the Carl Nielsen International Violin Competition in Denmark and the Young Concert Artists International Auditions in New York. Highlights during the 2017/18/19 seasons include a return visit to the Netherlands Philharmonic Orchestra and Marc Albrecht, as well as debuts with the Orchestre Philharmonique du Capitole de Toulouse and Thomas Søndergård, the Bamberger Symphoniker and Manfred Honeck, the Scottish Chamber Orchestra and Maxim Emelyanychev, the Helsinki Philharmonic Orchestra and Michael Sanderling, the Antwerp Symphony Orchestra and David Zinman, the Orchestre Philharmonique de Strasbourg and Aziz Shokhakimov, the Orchestre Philharmonique de Monte-Carlo and Tomáš Netopil, the Stavanger Symphony Orchestra and Christian Vasquez, the Symfonieorkest Vlaanderen and Daniel Blendulf and the Kyoto Symphony Orchestra and Lio Kuokman. He continues to appear as soloist of the Czech Philharmonic Orchestra for concerts, both in Prague and on tour, conducted by Semyon Bychkov, Jakub Hrůša and Thomas Adès. (recorded by Mezzo Live HD TV), as well as recital debuts in among others Kennedy Center in Washington D.C. and La Jolla, San Diego. Josef Špaček gives recitals and takes part in chamber music festivals in Europe (among others at the Rudolfinum in Prague, Konzerthaus in Vienna, Evian Festival, Kaposfest and Schloss Elmau), Asia and the USA (among others at Kennedy Center, Washington D.C., La Jolla, San Diego, ChamberFest Cleveland and Nevada Chamber Music Festival).